As FedEx is a preferred shipping carrier across the world, using FedEx services would be especially good for your store. For a WooCommerce store owner, FedEx offers a range of services, which you can use in different ways according to the unique needs of your business. You can display live shipping rates, print shipping labels, and provide tracking information to your customers. Overall, using FedEx as your shipping carrier will improve the overall customer satisfaction on your store. In this article, we will look into some of the important FedEx Shipping services and the process of printing labels. If you have a WooCommerce store, you can use a range of FedEx services to ship packages to your customers. Now, if you have an EasyPost account, you can connect these accounts and get the benefits of both. In fact, with the help of EasyPost ELEX Plugin, you can handle everything related to your FedEx shipping right from your WooCommerce store admin. First, let us take a look at some of the important FedEx services available with the plugin. FedEx Ground – This is one of the popular FedEx services. The transit time for this one would be 1 to 6 days. FedEx Ground Home Delivery – Here, the package will be delivered within 1-5 business days. FedEx 2 Day – The transit time would be 2-3 days. FedEx 2 Day AM – Same as FedEx 2 Day, but the delivery will be made before noon. FedEx Express Saver – The package will be delivered to the customer on the third business day from the day of delivery, and will be delivered by 4:30 pm. FedEx Standard Overnight – The package will be delivered by 3 pm the next business day. FedEx First Overnight – The package will be delivered by 8 am the next business day. FedEx Priority Overnight – Delivery will be by 10:30, next business day. FedEx International Economy – This will take 4-5 business days to reach an international destination. FedEx International First – This service will deliver your package to an international destination within 2-3 business days. FedEx International Priority – This is one of the fastest international services, as it will reach the receiver within 1-3 business days. How FedEx services are priced? Each of these services will be priced differently according to the destination address, and the weight and dimensions of the package. However, you can get custom rates with your FedEx accounts. Negotiated rates are the custom rates allotted to you by FedEx. To set up negotiated rates on your account, you have to talk to a FedEx representative. You can connect your FedEx and EasyPost accounts and use the ELEX EasyPost plugin to display your negotiated rates real time on your store. 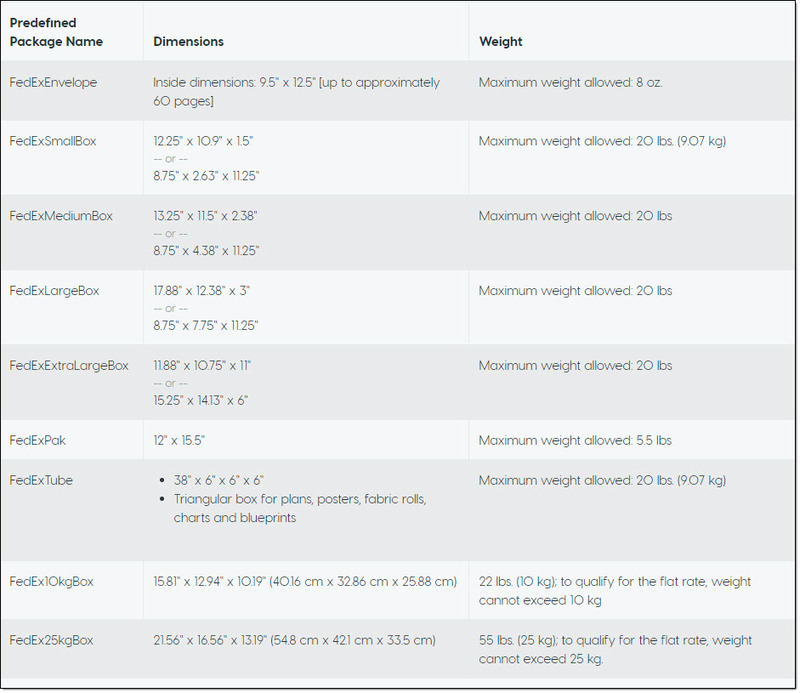 As a WooCommerce store owner, you will have products with varied weight and dimensions. FedEx offers a range of pre-defined parcels that will suit diverse shipping requirements. You will find a great range of standard and specialty boxes with FedEx, suitable for any kind of products. More importantly, if you choose one of the pre-defined parcels of FedEx, their experts will do the packing. Material and labor costs are included in the rate of the box that FedEx costs. This might be a great option to improve the overall customer satisfaction on your store. Here is a screenshot of all the FedEx pre-defined parcels available with EasyPost. Can I choose a pre-defined box with ELEX EasyPost Plugin? ELEX EasyPost plugin offers a box packing option, where you can define custom boxes suitable to the weight and dimensions of your products. If they suit your products, you can create boxes with those dimensions for automatic packing into one of the pre-defined parcels of FedEx. 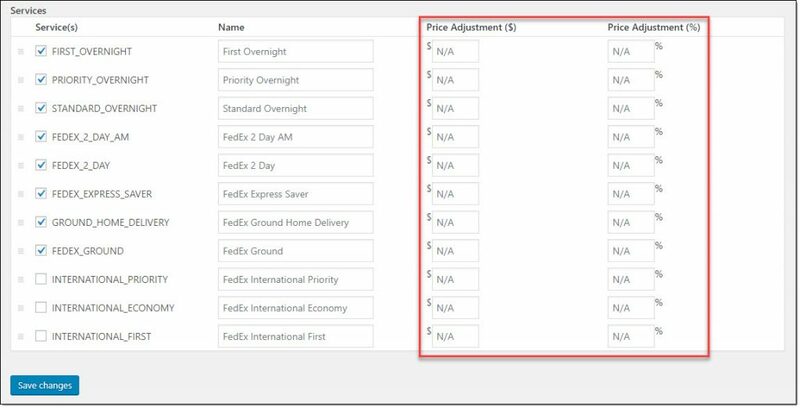 The option for creating custom boxes by specifying box dimensions will be displayed, when you choose “Pack into boxes with weight and dimensions” in the Parcel Packing field under the Packaging tab. 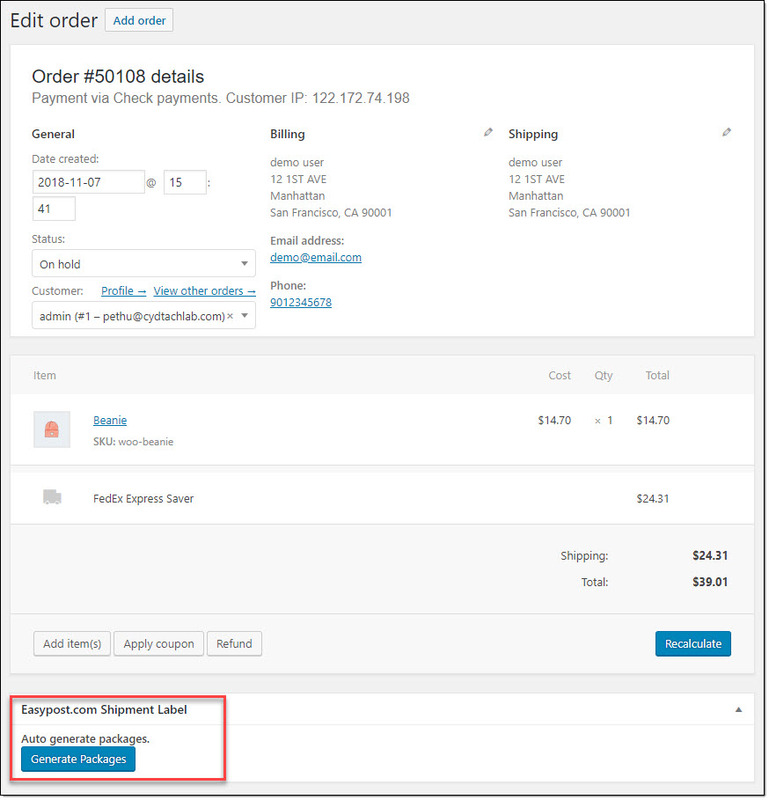 You can access the settings through WooCommerce > Settings > Shipping > EasyPost. Please check this article to understand how to configure parcel packing settings on ELEX EasyPost Shipping plugin. Interestingly, you can make price adjustments to each of the FedEx service, to compensate for the price of the box as well. You can access the different FedEx services, when you choose FedEx, in the EasyPost Carrier(s) field. You will find more details on setting up price adjustments to FedEx shipping services in this article. Once you have set up your FedEx shipping rates, and box dimensions right, it is really easy to print labels on your WooCommerce admin with our plugin. Every time a customer places an order with a FedEx service, you can simply go to the order details page and generate the packages. Now, you will be able to see the weight and dimensions of the package that has created automatically. You can add another package manually if necessary. Here, you can also choose the FedEx service that you want to use. Once the shipment is generated, you can simply click the Print button to open the label on a new tab on your browser window. The labels will be in PDF or PNG formats. Connect to a label printer, and you can print the FedEx labels right from your WooCommerce store admin. As the plugin creates the shipment, the tracking code is generated as well. This tracking code will be included in the order completion email, if you have already configured those settings (WooCommerce > Settings > Emails). Hope you have got an overview of FedEx shipping services that you can use with the ELEX EasyPost Shipping Plugin. For any clarifications, please contact our support team. Displaying live FedEx rates on your WooCommerce store. Printing FedEx shipping labels directly from your WooCommerce store admin. Configuring box packing settings for WooCommerce FedEx shipping.